Aunt Tillie. 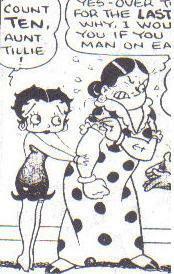 Betty Boops Auntie Tillie ( From the Comics Only). Wallpaper and background images in the Betty Boop club tagged: betty boop auntie tillie cartoon image betty betty boop icon boop family aunt.